Parking on Chicago or in the MN Jobs Lot across Lake St.
Our Cultural Liaison, Sean Smuda, is returned to Tours, France this summer (on June 16th!) to further artists exchanges and show his work at the OZ’Art gallery, vernissage/opening Saturday June 23rd!! While there (and here) he will create a tumblr site and embark on a series of bi-lingual podcasts of artists in all media. Many of the artists you’ve read about in Tours from his Metro magazine blog last year will be included. From Mpls, Frank Gaard, who currently has a show at the Walker Art Center will be the first from the Mpls side. 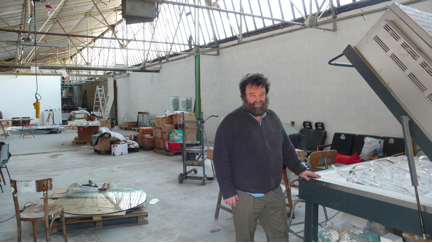 Peter Briggs (above), an accomplished artist from Tours also will be included. Sean will continue to work on a traveling collaborative visual arts show between the cities. Please help support this effort by helping us reach our goal –contribute what you can! To celebrate and give some context of last year’s and this year’s trip, Sean will be presenting a slideshow at his studio at 8PM on Saturday June 2 at his studio. Come one and all and see some of his art while you are at it, the piece he gave to the mayor of Tours last year has now been framed and hangs in his office! Venez nombreuses! This is a Minneapolis Tours Sister City event. Your tax deductible contribution will help foster more cultural exchanges. Please help us reach our goal of $2000, which would pay for a portion of Sean’s expenses, before he leaves on June 16th. Checks can be made payable to Minneapolis and Tours Sister Cities. If you are unable to attend the event, and would still like to contribute, please send you check to Helen Burke, Secretary, 4246 Grimes Ave S, Edina MN 55416. Thank you for your support.